For many of us, things don’t get much better than two-strokes. Now, stop sniggering or being rude at the back, we are on about motorcycle engines. Yes, for many of us, we are into classic bikes because we have a passion for those amazing two-stroke motorcycles of way-back-when. Both on the road and out on the tracks, for a while (around three decades, really) the two-stroke was king. 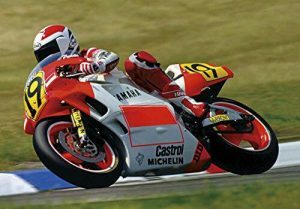 If you wanted the ultimate race-rep or road rocket: you bought – say – a 250cc two-stroke, or maybe (if you were loaded) a V4 RD500LC or a square-four RG500. If you raced, chances are you either naffed about on a production ‘diesel’ or managed to get your hands on a cheap two-stroke TZ. Either way, if you wanted to go places as a racer, Grand Prixs were where it was at and they, from the mid-1970s, had been two-stroke dominated. Yamaha and Suzuki dominated the first big era in 500cc GPs: Giacomo Agostini winning the first two-stroke title for Yamaha in 1975, before our own Barry Sheene took his brace of titles on the Suzuki. Then followed King Kenny Roberts’ trio of titles on a Yam, before the square-four Suzuki came back at them with titles for Marco Lucchinelli and Franco Uncini. 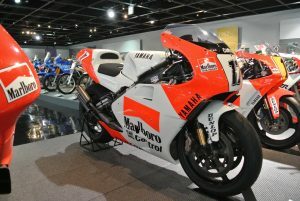 Honda would win in 1983 and 1985 with Fast Freddie Spencer, before Yamaha would again nab five out of the seven titles between 1986 and 1992 with the talents of Eddie Lawson and Wayne Rainey. 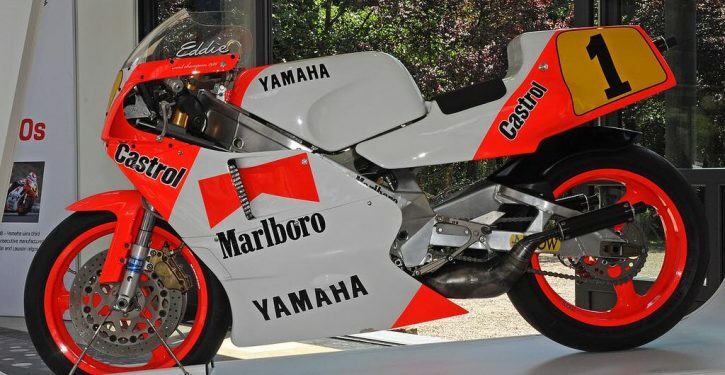 During this period, it was always kinda thought (or written by the journalists in the know) that the Yamaha YZR500 of the early 1990s was the best-balanced bike to have. 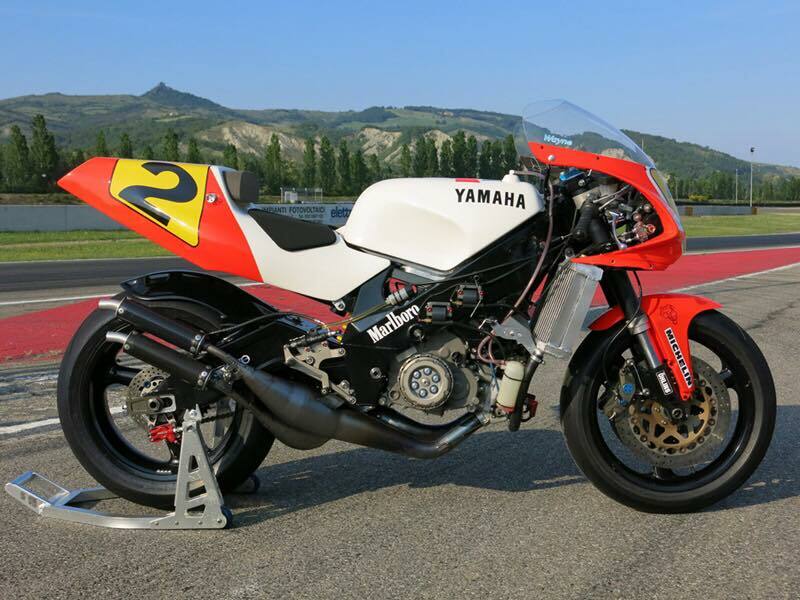 That’s as maybe, but we here at CB-Net think it’s also the best looking by far… You can keep your RGV500 (sorry Kev) and your NSRs (cheerio Mick) we love the looks of Yamaha’s V4 two-stroke race machine. And we got to see a fair few of them out there, including this one. Why? Well, 500cc Grand Prix racing was in the doldrums in the early 1990s. During the 1990 season there were only around 15 regular riders and 20 on the grid at best with local wild-cards. The old Honda RS500 triples were out there but hardly that competitive against the V4 machines. Yamaha stepped into the breach and decided to supply engines for people who could afford them – but who could build the chassis? Differences between the customer bikes and the factory ones? ; well, the works bikes had alloy crankcases instead of magnesium and power was probably down too, perhaps by about 20bhp to around 150bhp at the back wheel. Doesn’t sound a lot in today’s terms, but with the whole plot weighing about the same as a road-going 125cc bike, it makes for one hot ship. The big thing the works bikes had was data and knowledge – they knew what worked at each track. These ‘privateer’ machines would cost around £75,000 all told and they were raced by the likes of Sean Emmett, Peter Graves (Harris) Niall Mackenzie (on a ROC) and this Harris Yamaha pictured was bought by Medd Racing to be used by Kevin Mitchell in 500cc Grand Prix racing. You’ll see that the original five-spoke Marvic wheels have been replaced with Marchesini wheels and the 290mm brake discs have been replaced with 320mm carbon fibre ones that are gripped by AP Racing six-pot calipers. The rear brake has also been changed: there’s an AP rear caliper with the double chamber that allows a rear thumb brake to be used. The lever is situated on the left-hand fork upper. Thankfully what hasn’t changed on this Nigel Everett-fettled fire-breather are the looks… those pipes, that beefy ally chassis… it’s the 1990s all over again and we love it. No matter Pete, this is one beautiful bike! Price now: About the same! Engine: 498cc, liquid-cooled V4, two-stroke. FOR: Utterly gorgeous – the ultimate two-stroke track day machine!